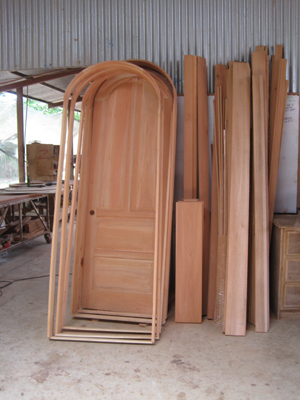 One of the most impressive things that people comment on while on our Discovery Tours is our wood shop and associated workshops where we make all our own windows, doors, custom wood cabinets, wrought iron gates and railings, granite counters and casings. 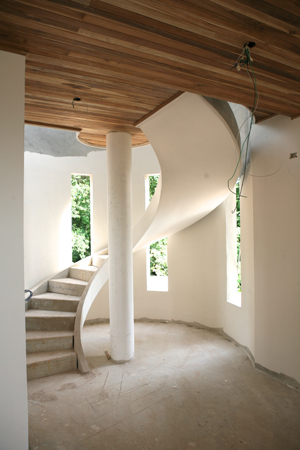 We have a number of buildings full of rough sawn hardwoods that we mill, plane, join and assemble into beautiful wood creations for our custom homes. The inventory of raw wood alone is worth many millions of dollars. 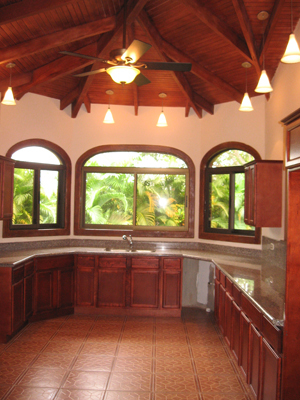 Our vinyl window line includes kilns for bending the frames into our signature domed top windows. We have a fusion welding machine to join the vinyl frames and rails to make windows of any size and shape imagineable. 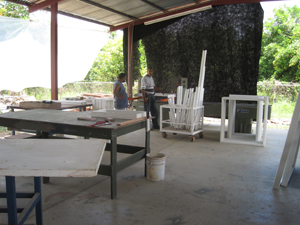 We also have a kiln to heat and bend the vinyl to allow our team to create round top windows, ovals and a variety of custom shapes.Our wrought iron work shop affords custom craftsmanship of gates with signature details, dolphins, horses, toucans, macaws etc have all been added to custom gates for some of the homes we have built. The entire area consists of a number of large warehouse buildings housing different areas of expertise. There are warehouses filled from floor to ceiling with ceiling fans, bathroom fixtures, high end faucets, electrical fixtures and everything else to build custom homes for our clients. 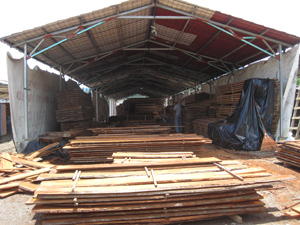 There are numerous buildings filled with a large variety of hard woods, nearly all from renewable forestry endeavors. We custom craft our cabinets using no plywood, particle board or softwoods, raising panels by hand after glueing up hardwoods, planing and sanding and finally applying HVLP finishes in a custom spray booth. The shop features an 8' by 16' panel saw, a variety of table saws using the finest in Besemeyer fences, a 48" wide belt sander, planers, joiners and hand tools. 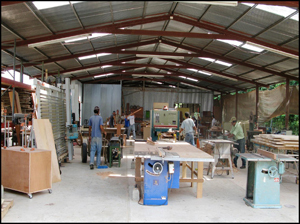 The entire shop is served by a huge dust collection system as well as pneumatic air stations throughout the shop. One entire area of the shop is devoted to the production of granite counters. Large slabs of stone are brought in from around the world and then worked with carbide and diamond tools to form any counter imaginable. 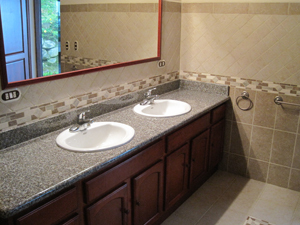 Although granite is an upgrade from our standard counter finishes, many owners choose granite. The cost is minimal when compared to the cost of granite in the states. Our wrought iron shop starts with raw iron stock and through the use of custom bending jigs and welding tools, the iron is bent and shaped into works of art. Then the pieces are welded together, hinged, primed and painted to form some of the finest wrought iron gates and railing I have ever seen. The finished projects are painted with accent colors and even gold tipped on occassion. The shop has grown based on our demand for custom items for the houses we are building. We realized that in order to assure a steady and reliable supply of signature doors, custom windows, custom cabinets and the like, we were forced to control the entire production from start to finish. When you tour the wood shop area, be sure to have a camera ready or better yet a video camera. The variety of items you are liable to see will impress even the most discriminating cleint. 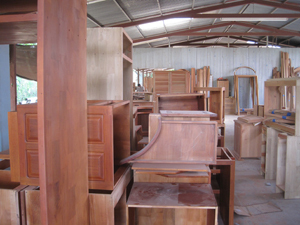 You will see millions of dollars in raw wood as well as a variety of types and sizes.